He was speaking a day after a bomb attack in the Turkish capital Ankara that killed 37 people. No group has so far claimed the blast, but Prime Minister Ahmet Davutoglu said evidence "almost certainly" pointed towards the banned PKK (Kurdistan Workers' Party) separatist group. On Monday, Turkey launched air strikes against Kurdish rebels in northern Iraq. Mr Davutoglu said 11 people had so far been detained in connection with the attack. "There are very serious, almost certain indications that point to the separatist terror organisation,'' he said, referring to the PKK. Four of those detained were in the south-eastern city of Sanliurfa, according to Turkish media. Officials were quoted as saying the car used in the bombing was traced to a showroom there. One of the bombers, who also died in the blast, was "definitely" a woman, Deputy PM Numan Kurtulmus said earlier on Monday. Mr Kurtulmus told reporters that a second suicide bomber was male, but had not yet been identified. Earlier, unnamed security officials said the female bomber was a member of the PKK from the eastern town of Kars, who joined the group in 2013. Eleven warplanes carried out air strikes on 18 PKK targets in northern Iraq including ammunition dumps and shelters in the Qandil and Gara sectors, the army said. The PKK confirmed the strikes. Meanwhile, curfews have been imposed in two mainly Kurdish towns in south-eastern Turkey, Yuksekova and Nusaybin, as security operations are carried out against Kurdish militants, Anadolu news agency reports. Another curfew is due to start in the city of Sirnak. Funeral services have been taking place for some of those killed. Among the victims was the father of a Turkish international footballer. More than 100 people were wounded in the blast. It has also been carrying out a campaign of bombardment against Syrian Kurdish fighters of the People's Protection Units (YPG), which it regards as a extension of the PKK. Turkey's pro-Kurdish political party, the HDP, issued a statement condemning the attack, saying it shares "the huge pain felt along with our citizens". That bombing was claimed by a Kurdish militant group, the Kurdistan Freedom Hawks (TAK). 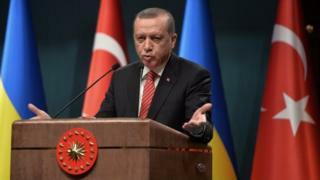 It said on its website that the attack was in retaliation for the policies of President Erdogan. Turkey, however, blamed a Syrian national who was a member of the YPG.